The NAR was created in 1957 as an advocate of the model rocketry hobby. Over the past four decades the hobby has grown to encompass rocket motor types and performance unavailable to the modeler at the NAR’s inception. 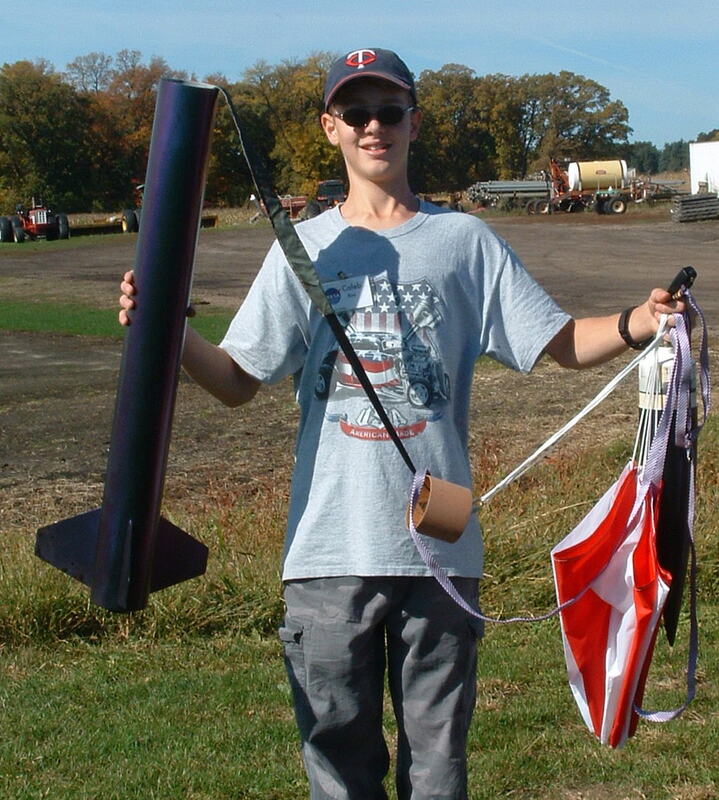 In response to this growth the NAR offers a certification process which permits individuals to purchase and use rocket motors whose physical constraints and performance exceed traditional model rocket boundaries. Rocket motors which exceed model rocketry motor definitions and the models that use these motors are collectively referred to as high power rocketry. In order to expand the opportunities available to Junior and Leader members of NAR, the following Jr. HPR Participation Program is offered to Junior/Leader members ages 14 through 17 so that they may fly H and I class motors. The Level 1 Junior/Leader HPR participation program will follow the same basic procedure used for the HPR certification for Senior NAR members. However due to legal restrictions pertaining to the purchase and possession of high power rocket motors, ejection charges and related items, there are additional requirements, as outlined in this procedure. Junior High Power participation is intended to provide a measure of the modeler’s competence to avoid gross violations of good modeling practice and safe model operation. The program is not foolproof. A single demonstration of a modeler’s skills does not guarantee consistent safe performance. The participation program does not replace competent range personnel (note that high power range safety officers will require High Power certification of the sponsor per NFPA 1127) to provide assurance of safe models and operating practices. The individual seeking Junior Level 1 High Power Participation (JrHPP) qualification must fall in the age range of 14 through 17 years old. The individual must be a junior/leader member in good standing of the National Association of Rocketry (NAR) at the time of certification. Evidence of NAR membership will be requested prior to the participation attempt. Acceptable evidence of membership includes the NAR membership card, a canceled check indicating payment of membership fees, or participation in a NAR event where membership status is verified and indicated on the event materials. All HPR flights performed by the Junior and Leader NAR member must be directly supervised by an adult who is HPR certified Level 1 or greater, and can legally purchase and possess the motor or reload kit used for the flight. Motors used for Junior HPR Participation attempts must be currently certified by the NAR, or by another organization (e.g., Tripoli) with a recognized certification program. Manufacturer’s designations, not certification test data, will be used to identify suitability for the certification level being attempted (e.g., an H128 is an H, a G75 is a G). Model propelled by Hybrid motors require deployment charges external of the motor and these charges are currently regulated. For this reason, Hybrids cannot be used for Junior HPR Level 1 Qualification flights. The Junior HPR Participant must follow similar guidelines as a regular member, in that their flight is qualified by a NAR Certification team. At least one of the team members must be already certified at Level 1 to judge Junior HPP individual’s Level 1 participation attempt. Junior Level 1 Participation qualification may be administered by a single NAR Level 2 certified individual; the two certified individuals requirement is waived in this case. Junior HPR Participation attempts must be witnessed in person by the certification team. Video recordings of a certification flight are not acceptable. The Junior HPP attempt may be accomplished at any launch where sufficient individuals meeting the requirements of paragraph 2 are available. The junior member attempting his Jr HPP qualification must build the rocket that they wish to use for their qualifying attempt. The model may be either scratch built or a kit and the rocket must be constructed in such a manner that it will perform safely under the additional stress of an HPR motor. Youth teams attempting to qualify cannot use the same rocket, but rather are required to each build their own model. In addition, the member must use an active recovery system for their Jr HPP attempt, which usually includes parachute recovery; details of these recovery methods are described in the Definition of Active Recovery. The modeler must demonstrate his ability to build and fly a rocket containing at least one H or I impulse class motor. Cluster or staged models used for certification may not contain over 640.00 Newton seconds total impulse. In the case of a cluster or staged model, at least one of the individual motors must be an H or I impulse motor. Combinations of D, E, F or G motors that meet the impulse requirements do not qualify as the model does not contain at least one H or I impulse motor. Single use, reloadable, or hybrid technology motors are permitted. The junior modeler, due to regulations, MUST NOT HANDLE THE MOTOR. It is encouraged that the Junior participant instructs his certified Adult sponsor in the assembly of a reloadable motor, if one is used for the qualification flight. The certified adult sponsor must handle the motor at all times. The junior member can install the motor retention system once the adult sponsor has placed the motor inside the mount of the rocket. The individual attempting their Jr HPR Participation flight must also complete a NAR Junior High Power Participation Application prior to their qualification attempt. The adult supervising the flight must be willing to be listed as the flier of record for the flight and must understand that they are assuming full responsibility and liability for the flight as if it were their own. The Junior HPP member can be listed and announced as the owner of the rocket. The supervising adult must be present when the Junior/Leader HPR participant delivers the airframe to the RSO for pre-flight inspection and placement on the launch pad. The model will be subjected to a safety inspection prior to flight. The safety inspection form is on the back of the NAR Junior High Power Particiation Application. During the safety inspection the modeler will be expected to provide oral answers to technical questions related to the safety and construction of his model. The questions may include (but not limited to) identification of the model’s center of gravity and center of pressure, methods used to determine model stability, and interpretation of the rocket motor’s designation. The certification team will initial (or check) the blocks indicating that model safety, motor certification, and the existence of a FAA waiver (if required) in effect were verified prior to flight. The individual will fly his model. The flight must be witnessed by the certification team members and adult sponsor. Stability, deployment of the recovery system, and safe recovery should be considered when evaluating safety of the flight. Models experiencing a catastrophic failure of the airframe, rocket motor, and/or recovery system (e.g., shock cord separation) will not be considered as having a safe flight. The model must be returned to the certification team after flight and be inspected to verify engine retention and for evidence of flight-induced damage. The certification team will initial the blocks indicating that a safe flight was made and that the post-flight inspection was satisfactory. In general, the guideline for acceptable flight damage is that the model could be flown again without repair. It is left to the judgement of the certification team to differentiate between flight damage and “normal” maintenance to assure reliability (e.g., shock cord replacement to prevent future flight problems). “Zippering” of the body tube is another area of flight damage left to certification team judgement for acceptability. The certification team will sign the participation sheet to indicate that the Junior HPR Participation attempt was successfully completed. Both the participation sheet and the Participation Verification card must be signed. The Participation Card and the participation sheet are normally returned to the Junior HPP individual after the flight. The participation sheets are returned to NAR Headquarters. No fees are required. The participation sheets must be returned by the Junior HPP individual, the sponsoring adult or the event sponsors to NAR Headquarters to allow updating the NAR database. A new NAR membership card will be issued showing Jr HPR Level 1 Participation upon receipt of the participation paperwork. The participation card is valid for one year after the qualifying date or until the end of the Junior NAR member’s membership, whichever comes first. The card is recognized as proof of the High Power participation level. The temporary participation card should be destroyed upon receipt of a new NAR membership card which shows the Junior HPR Participation level. When the HPR Level 1 Junior Participant member turns 18 years of age, the adult supervision requirements are lifted and the participation level converts to that of a NAR Senior member, a full HPR Level 1 Certification. At that time the member also becomes eligible to attempt their NAR L2 HPR certification. Falsification of data or statements by the participating individual or sponsor will result in revocation of their Jr HPR Level Participation qualification. Falsification of data or statements by the certification team, e.g., failure to secure a FAA waiver, can result in revocation of the team members’ NAR memberships. Qualifying junior members at this level permits them to fly single or multiple motor rocket flights with motors having a maximum total impulse of 640.00 Newton seconds. The qualification flight and all future flights must be single deployment only. This is due to regulatory requirements of ejection charges used in dual deployment systems. On board electronic devices are permitted as long as they are not used for deployment. As models with hybrid motors require regulated ejection methods, they are not permitted to be used by the Junior HPR Level 1 Participant at this time. The qualified Junior HPP flier must continue to have a sponsor for all subsequent flights and the sponsor is required to follow the same rules listed for qualification (ie: the sponsor must continue to handle the motor for all subsequent flights.) This requirement may expire once the Junior HPP flier reaches the full member legal age of 18, as long as provisions are met regarding federal, local and state regulations as set forth in this document. Junior/Leader NAR members who are HPR Level 1 qualified may fly at Tripoli launches as long as the Prefect and RSO/LCO team agree to allow the Jr HPP sponsor’s acceptance of liability. Lapses in the NAR membership over one year will void all Junior HPR Participant qualifications. The junior participant will have to re-qualify for their HPR Level 1 Participant status.